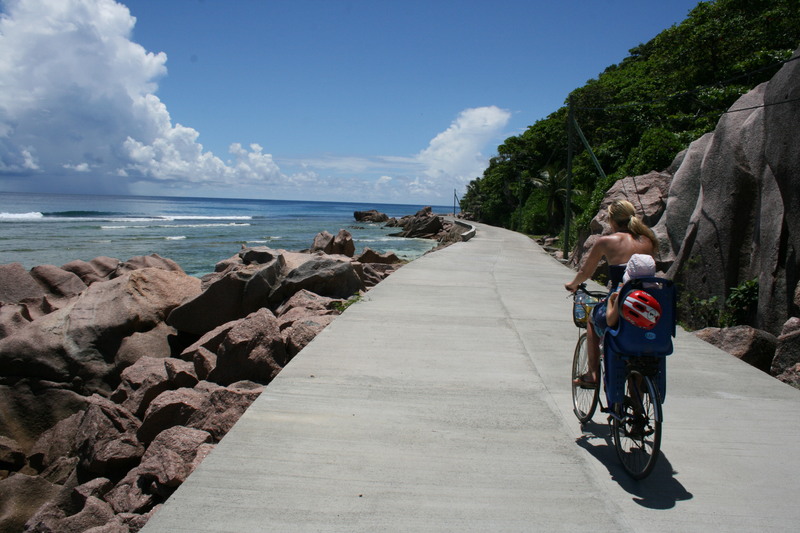 The Seychelles consist of many different islands. One of the calmer ones is La Digue. Only 3x2km big it’s easy to orientate yourself. A broad diversity of hotels and guesthouses with varying prices make it easy for everyone’s budget. 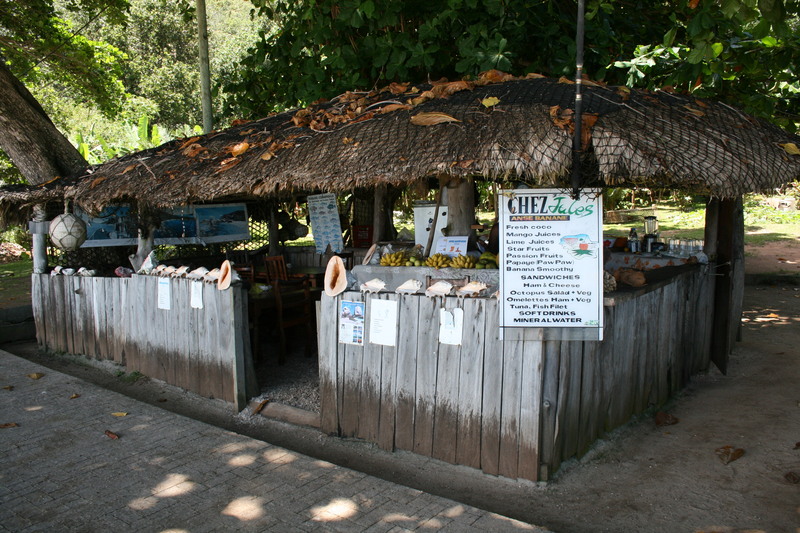 Although the Seychelles and especially La Digue are not a budget friendly destination. 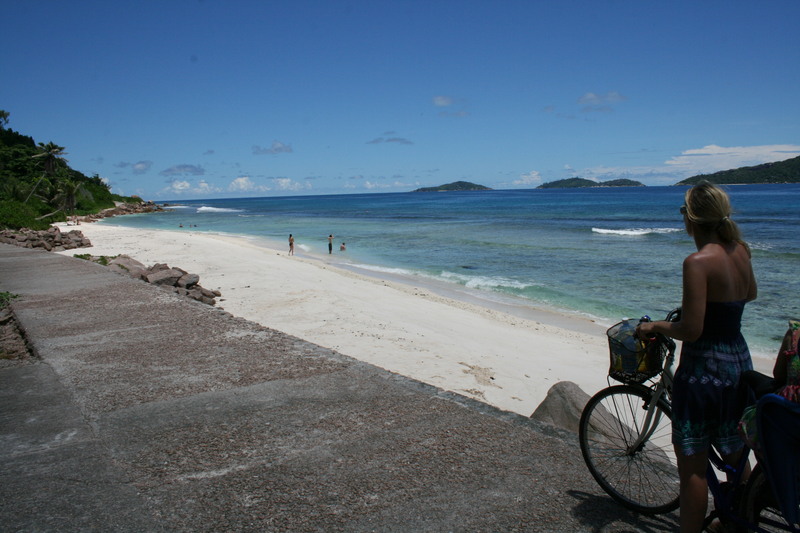 Nevertheless La Digue on the Seychelles is the perfect place for enjoying time on the beach and do cycling tours. There are only taxis or construction trucks. And many many bicycles. The bike rental companies rent also children bikes. Nevertheless we took 2 bikes with baby seat to be flexible enough if the older one complains. It happened that we locked her bike on a fence and she went on on my back seat. 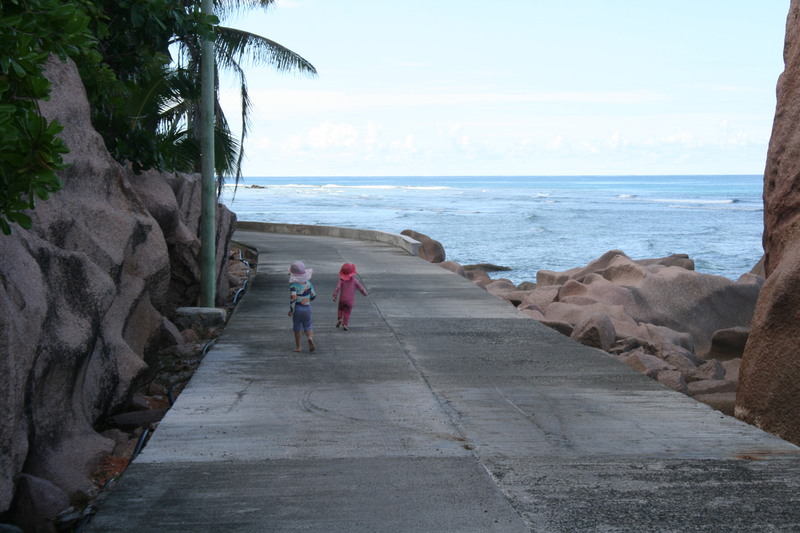 Unfortunately you can’t surround the whole island La Digue, but you can go until a certain point to the east. 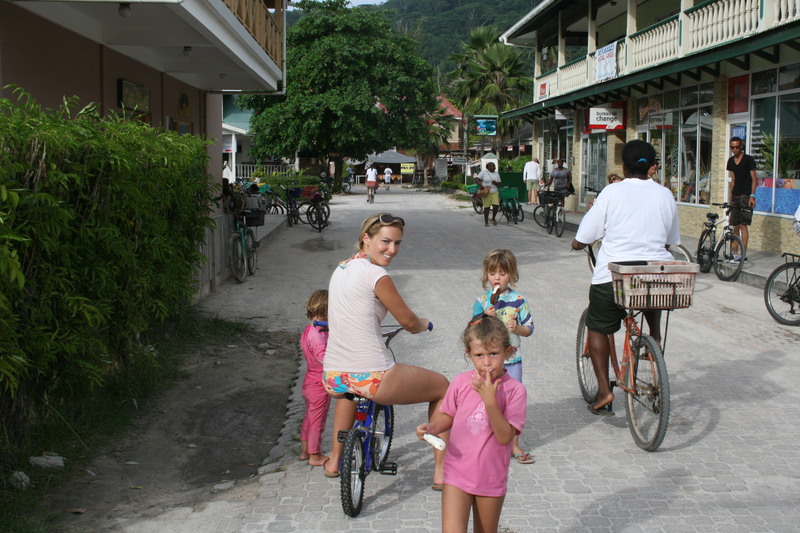 On mostly plastered streets through tropical forest, jungle and directly next to the sea it is awesome to cycle around. Rarely hills make it even easier. 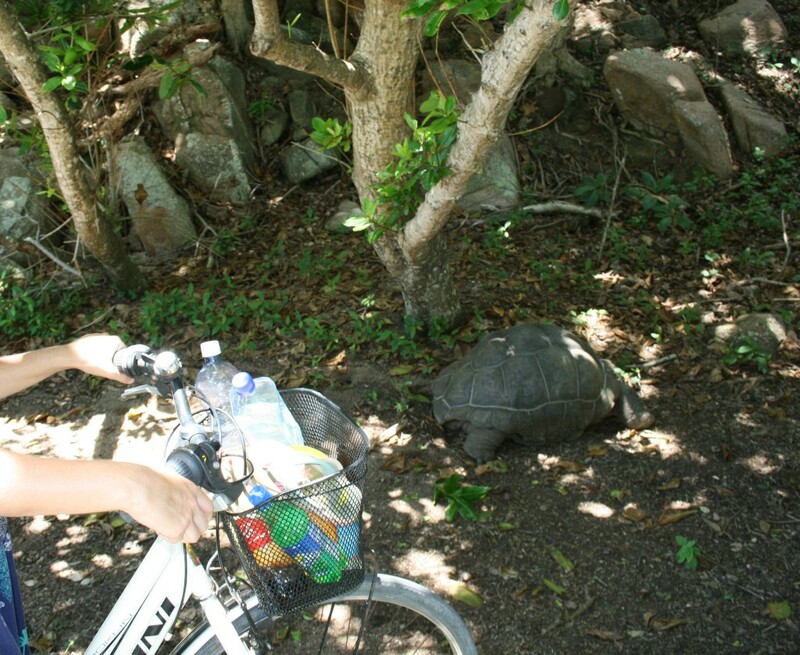 On our way to the east via La Passe we made some discoveries: giant turtles and bats just next to us. In the forest we saw lizards and giant crabs, common animals on the Seychelles. Some small shops are on the way, but we made the experience that it’s better to have drinks and biscuits always with us. On the very eastern point is a fantastic snack next to the beach. 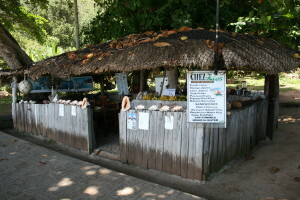 It offers octopus salad, fish curry, sandwiches and fresh fruit juice. I love exploring an area by bike and you certainly picked a great one to do it in! Thanks for linking up to #FridayPostcards this week! Can’t wait to follow more of your journey next week! Yes, you can get both of them. I can recommend to ask for Nedy. He’s very reliable and helps if you have a puncture. There are golf carts and a few taxis for those who cannot walk. The island is small. Everybody knows each other. You’ll feel home soon. Nice post. I was checking continuously this blog and I’m impressed! Extremely helpful info specially the closing section 🙂 I take care of such information a lot. I used to be looking for this certain info for a very lengthy time. Thanks and best of luck.